It goes without saying that society is facing an increasing miniaturization of devices at a submicron- and even at a nanoscale in various fields of application . In medicine and biology, for example, there is a need for high-precision actuators and manipulators for work on fluid filtration and living cell manipulation . Also, the increasingly-popular lab-on-a-chip technology takes advantage of highly-miniaturized mechanical systems – Micro-Electronic Mechanical Systems or MEMS – to fit efficient analysis systems in a very small space. Further progress in these fields requires a continuous development of materials with submicron- and nanoscale functions, as well as of tools that can facilitate the production and characterization of these devices. Commonly used piezoceramic actuators deliver a ~0.2% strain at a relatively high potential of 150V or higher [3,4]. Considering that it is desirable to develop energy efficient devices, and also to see the use of actuators in low-voltage devices, such as MEMS, much lower operational parameters are required for modern actuating materials. Polymer-based actuation materials have been developed that offer extraordinary capacity for induced deformation [5,6], but have the drawback of being soft and of not-withstanding higher temperatures. In recent years metallic nanofoams were explored to act as actuators, creating so-called “metallic muscles” with exceptional capabilities that are very attractive for modern actuators: low throughput voltage requirements, high extension yield, high strength and stiffness [7,8,9,10,11,12,13]. In this respect the beautiful work by Jörg Weißmüller et al. and the pioneering work by Herbert Gleiter and collaborators have to be mentioned [7,8]. The actuation mechanism in metallic muscles based on nanoporous metals with high surface-to-volume ratios is different to piezoceramics . As starting point, note that in crystalline materials, surface atoms have fewer neighbors than those in the bulk. This results in unbalanced interatomic surface bonds, which in turn give rise to an excess negative surface charge. The unbalanced surface bonds will redistribute at the surface so as to strengthen the surface atoms by shortening the interatomic distance with respect to the bulk . Shortening of the surface interatomic distance results in a positive surface stress (tensile stress, i.e. a positive displacement to bring the atoms back to an equilibrium distance with respect to the bulk [16,17]). Subsequently, a positive charge injection at the surface will neutralize the existing excess negative surface charge, lowering in that way the tensile surface stress. This results in the relaxation of the surface atom positions via an increase in the interatomic spacing. In order to preserve the mechanical equilibrium, bulk atoms experience less compressive stress, resulting in a positive outward (tensile) displacement . Obviously, these surface stress-induced deformations are not detectable in macroscopic dense metals, but they are thought to become significant in nanostructured metals where the fraction of surface atoms versus bulk becomes substantial. For actuator applications, the electronic charge distribution at a nanoporous metal interface can effectively be tuned in an aqueous electrolyte during cycling voltammetry experiments, where relatively small electrical voltages, of the order of 1 V, are needed to bring positive or negative charge carriers (ions) from the electrolyte to the nanoporous metal interface [8,19,20]. Although nanoporous metal actuators offer a unique combination of low operating voltages, relatively large strain amplitudes, high stiffness and strength, the emergence of nanoporous metal actuators in practicable applications is still delayed. The challenge to their further development in viable applications can be considered threefold, but principally concerns the aqueous electrolyte that is needed to inject electronic charge in the space-charge region at the metal/electrolyte interface : At first, an aqueous electrolyte limits the usage of metallic muscles to wet environments, whereas most of the practical applications require artificial muscles that can operate in dry environments. A second major concern is that the relatively low ionic conductivity of aqueous electrolytes limits the actuation rate of the actuator. Simply replacing the aqueous electrolyte by a solid one is not a better alternative because the actuation rate of all-solid-state electrochemical actuators is more severely hampered by the low room-temperature ionic conductivity of solid-state electrolytes. A third and final concern is the severe coarsening (undesired growth) of the ligaments in nanoporous metals during electrochemical processes , including actuation via redox reactions. Specifically, the undesired ligaments growth (coarsening) will cause the metallic muscle to lose in performance as a function of time, since the strain amplitude in nanoporous metal actuators is ligament-size dependent as shown in Fig.1, where strain amplitudes are plotted as a function of the average ligament size. 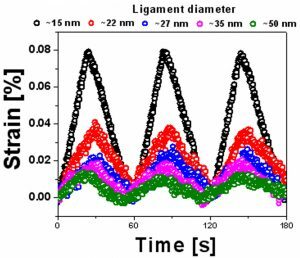 Consequently, ligaments growth in nanoporous metals during electrochemical actuation is undesirable. Fig.1 Ligament size-dependence of the charge-induced strain in nanoporous metals. The strain amplitude recorded on five NPG samples with different ligament sizes decreases with increasing ligament size. This shows that ligaments growth during electrochemical actuation is undesirable. In view of these various restrictions caused by the electrolyte, an electrolyte-free approach is desirable for actuation in nanoporous metals. In fact, the following features are a prerequisite for a breakthrough in the field of artificial muscles: (i) no usage of aqueous or solid electrolyte, (ii) a fast actuation rate and (iii) a single actuating component as in piezoelectric materials. 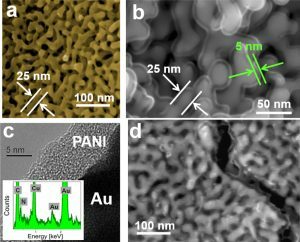 In order to tackle those problems, in our Applied Physics- Materials Science group of the Zernike Institute for Advanced Materials in Groningen, we have been developing advanced nanoporous metals composites for a new electrolyte-free actuation concept in metallic muscles, including nanoporous gold/SnO2 (Fig. 2) and nanoporous gold/polymer composites (Fig. 3). In the latter case, we have specifically been exploiting nanoporous gold/polyaniline composites to put metallic muscles to work [23,24,25]. The development of a nanoporous gold/polyaniline composite first involves the synthesis of nanoporous gold (NPG) using the standard dealloying method [26,27,28,29,30,31,32]. The typical bicontinuous morphology of the synthesized NPG is shown onFig.2a and Fig. 3a. Next, we use the electropolymerization procedure to grow a uniform nano-coating of polyaniline (PANI) onto the internal surface area of NPG [21,22]. 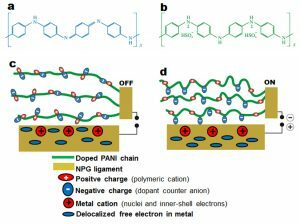 Dopant sulfate anions co-adsorbed in the polymer coating matrix are then exploited to tune the electronic charge density at the NPG/PANI interface and subsequently generate macroscopic dimensional changes in our NPG, as it will be shown in the next sections. Fig. 2 Nanoporous-Au/SnO2 composite. (a) Scanning electron micrograph showing the bicontinuous morphology of NP-Au and (b) NP-Au/SnO2 composite.SnO2 was grown into pores of nanoporous Au by electrochemical deposition. (c,d) High resolution transmission electron micrographs showing a ~10 nm-thick coating of SnO2 covering the ligaments of NP-Au. Fig. 3 Microstructural characterization of NPG/PANI. (a) Scanning electron micrograph showing the bicontinuous morphology of NPG. (b, c) Scanning and transmission electron micrographs showing a ~5 nm-thick PANI skin covering the ligaments of NPG. The inset of c displays the EDX spectrum of PANI. C and N come from aniline (C6H7N), Cu and Au come respectively from the Cu grid used as sample holder and the NPG. (d) Fracture cross-section of NPG/PANI; It can be seen that the polymer envelope covering the ligaments is present into the bulk of the composite material [23,25]. A schematic illustration of our NPG/PANI bulk heterojunction actuator is shown in Fig. 4a-d. The actuator is connected to the voltage supplier in one of the following two configurations: NPG/PANI/Au with NPG as anode and solid Au as cathode, or Au/PANI/NPG with solid Au as anode and NPG as cathode. Both configurations can be used because the two contact electrodes consisting of NPG and dense Au are made of the same material. Since the work functions of NPG and solid Au are comparable with the highest occupied molecular orbital (HOMO) of PANI on the one hand , and since PANI is a p-type semiconductor on the other hand , electronic charge transport in the NPG/PANI hybrid actuator is only controlled by holes conduction (i.e. “hole-only” device), because the high offset between the Fermi level of the metal and the lowest unoccupied molecular orbital (LUMO) of PANI restricts electrons injection from the metal into the LUMO of the polymer . We used an external electric potential to inject holes from the metal anode (either NPG or solid Au) into the HOMO of the PANI nano-coating . A particularity of the NPG/PANI/Au or Au/PANI/NPG configuration is that electronic charges injected from the anode flow through the PANI coating before reaching the cathode. We have found that the electronic charge transport through the polymer coating follows an Ohmic behavior at ambient temperatures . Fig. 4 The NPG/PANI bulk heterojunction actuator. (a,c) The main part of the actuator consists of NPG whose ligaments are coated with a ~5 nm-layer of PANI. (b) One edge connected to the positive terminal of the voltage supplier consists of NPG. (d) The other edge connected to the negative terminal consists of NPG having its ligaments covered with ~10 nm thick layer of PANI. (e) Energy-level diagram of the system NPG/PANI/Au system in the absence of external electrical potential. 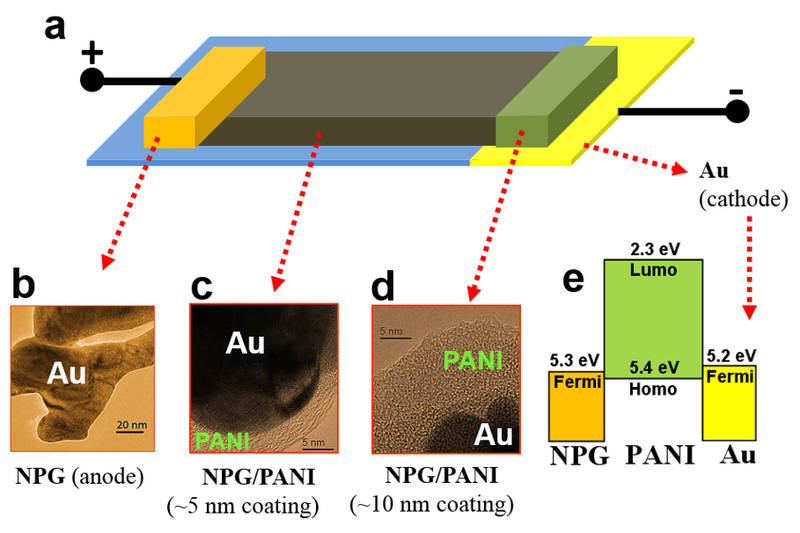 We have measured reversible dimensional changes in the NPG/PANI bulk heterojunction material during successive forward-reverse voltage cycles between 0 and 2 V, and at various sweep rates ranging from 1 to 2000 mV/s. Note that when metallic muscles are put to work via aqueous electrolytes, the corresponding dimensional changes vanish at sweep rates beyond a few tens of mV/s. In contrast, reversible dimensional changes were still observed in our NPG/PANI electrolyte-free actuator at sweep rates far beyond 1 mV/s as illustrated in Fig. 5a and 5b, where the strain amplitudes are plotted as a function of time and sweep rate, respectively. By setting the sweep rate at 2000 mV/s, a strain of ~0.05% was achieved in our electrolyte-free actuator in 1 s, rather than 1400 s as with the electrolyte . This corresponds to a strain rate of 5×10-4 per second, which is thus about 1400 times higher than that achieved in metallic muscles via an electrolyte. These results demonstrate that by virtue of the novel electrolyte-free actuation approach, metallic muscles can operate in dry environments at high strain rates, much higher than those of common electrochemical artificial muscles. Besides electrolyte-free actuation, it is worth mentioning that we have also exploited the combination of a nanoporous metal and a polymer to add a new functionality to metallic muscles operating in aqueous electrolytes. Specifically, when our NPG/PANI composite is used as electrochemical actuator, the NPG undergoes reversible dimensional changes while the PANI undergoes reversible changes in color during electro-oxidized/reduced . Fig. 6 Potential-induced charge redistribution at the NPG surface. (a) Undoped PANI (blue insulating emeraldine base). (b) Doped PANI (green conducting emeraldine salt). (c) NPG/PANI interface in the absence of an electrical potential. Both positive and negative charge carriers along the polymer chains are held together by electrostatic interaction. An initial electronic charge distribution exists at the metal surface. (d) NPG/PANI interface in the presence of an electrical potential. Positive charge carriers along the polymer chains become involved in electrical conduction; localized negative charge carriers along the polymer chains electrostatically interact with the positive metal electrode, giving rise to electronic charge redistribution at the metal surface. As mentioned above, dimensional changes could take place in nanoporous metals as a result of electronic charges accumulation in the space-charge region at the nanoporous metal interface. This should be the case for our NPG/PANI composite, if an opposite space-charge builds up in the polymer coating during the voltage sweeps. However, we have found that hole-transport in the PANI coating is governed by an Ohmic current, rather than a space-charge limited-current . This excludes the possibility of dimensional changes in our NPG/PANI composite as the result of the build-up of a space-charge in the polymer coating. As schematized in Fig.6a, in its non-conducting state, the blue emeraldine base form of PANI consists of electrically neutral molecular chains . PANI is made conducting (green emeraldine salt) by protonic acid doping or oxidative doping. During oxidative doping, an electron is removed from the pi-conjugated backbone, resulting in a free radical and a positive charge (polymeric cation) as schematized in Fig.6b. In the case of sulfuric acid doping , the charge neutrality in the doped PANI is maintained by negative sulfate counter ions co-adsorbed into the polymer matrix during the doping process [41,42,43]. The schematic structure of a doped PANI chain is shown in Fig.6b; both polymer cations and sulfate counter anions are held together by electrostatic interactions . In the absence of an external electrical potential (“off” stand in Fig. 6c), polymer chains adopt shapes that favor minimal intra- and inter electrostatic interactions in the molecular chains. These shapes can be linear as reported by Lee et al for a monolayer coating of PANI on a single Au crystal . When a suitable electrical potential is applied on the hybrid actuator, e.g. in the NPG/PANI/Au configuration (“on” stand in Fig. 6d), holes are injected from the positive NPG electrode into the PANI coating. The transport of these holes across the polymer film involves the cations and free radicals on the pi-conjugate backbone , the positive charges on the pi-conjugated backbone become mobile during electrical conduction whereas the negative sulfate counter ions are localized along the chains. The total amount of negative charges in the polymer matrix, arising from co-adsorbed sulfate anions was estimated for a 5 nm-thick PANI coating and was found to be ~3.2 C per m2 coating, assuming that each repeating unit of PANI contributes with two sulfate anions as illustrated in Fig.6b. This amount of charge is comparable to the quantity of electronic charge involved in dimensional changes in nanoporous metal/electrolyte hybrid actuators. During the potential sweeps, this relatively large amount of negative charge dispersed into the thin polymer matrix electrostatically interacts with the positive NPG electrode . PANI molecular chains undergo conformational changes in order to bring the sulfate anions (i.e. negative charge carriers) in the proximity of the positive metal electrode; sulfate anions present in the first monolayer of PANI are eventually electro-adsorption onto the metal electrode as reported by Lee et al and illustrated in Fig. 6d . The electrical potential-induced interactions between sulfate anions and the ligaments of NPG give rise to electronic charges redistribution at the ligaments interface . Typically, the delocalized free electrons in the metal move from the interface towards to bulk, leaving the metal interface with positively charge metal ions (see Fig. 6d). These metal cations consist of nuclei and inner-shell electrons of metal atoms. As aforementioned the delocalization of negative charges from the metal surface towards the bulk weakens the interatomic bounds between metal surface atoms, resulting in relaxation of these metal surface atoms. This gives rise to an increase in tensile stress at the surface of the ligaments. Due to the high surface-area-to-volume ratio of NPG, the dimensional changes in the ligaments result in an overall macroscopic volume change in the NPG electrode , which is experimentally measured during forward voltage sweeps in the NPG/PANI/Au configuration. During the reverse voltage sweep where the applied electrical potential is gradually removed, electrostatic interactions between the negative sulfate ions and the positive metal electrode gradually vanish, charge redistribution takes place again at the metal interface and the initial charge distribution is restored  . Although the dimensional changes in the NPG/PANI hybrid actuator do not come from actuation in PANI as emphasized above, in the present understanding of the process, it is believed that conformational changes in the polymer chains play an important role during actuation: (i) changes in molecular shapes of the polymer bring the sulfate anions in the proximity of the metal electrode, or take these counter anions away from the metal electrode depending on the sign of the potential applied at this electrode . (ii) The high rate of which conducting polymers undergo conformational changes as highlighted by Yip and co-workers  might justify the high actuation rate recorded on the NPG/PANI composite material: rapid shape changes in polymer chains favor a fast exposure of sulfate anions to the positive NPG electrode and consequently rapid charge redistribution at the NPG interface. In contrast, when ions are transported through an electrolyte, a high actuation rate is hampered because of the low ionic conductivity of electrolytes . In conclusion, we have demonstrated a new electrolyte-free approach to generate work from metallic muscles by exploiting a nanoporous metal/polymer interface rather than the common nanoporous metal/liquid electrolyte interface. In this actuation concept a doped polymer coating is grown onto the ligaments of a nanoporous metal and dopant counter ions present in the polymer coating matrix are exploited to modulate the electronic charge distribution at the nanoporous metal surface, resulting in surface stress changes and dimensional changes in the nanoporous metal. With this actuation approach, many of the drawbacks encountered in metallic muscles operating in aqueous electrolytes have been circumvented. In particular, the nanoporous metal/polymer hybrid actuator is an all-solid-state device, like piezoceramic actuators, and its actuation rate is about three orders of magnitude higher than that of metallic muscles operating in aqueous electrolytes. The exciting outlook for nanoporous metallic systems is not limited to the fields of sensors and actuators, however, where electrical or electrochemical energy is converted into mechanical work. The use of nanoporous metals in other energy-related applications is also a challenge. For example, there is currently much interest in the sustainable production of hydrogen fuel by the decomposition of water-based solutions into hydrogen and oxygen as the only products using alkaline electrolyzers. In general, unsupported non-precious metals oxygen-evolving catalysts require at least ~350 mV overpotential to oxidize water with a current density of 10 mA.cm-2 in 1 M alkaline solution . Detsi et al. have recently developed a robust ultrafine mesoporous NiFe-based oxygen evolution catalyst made by partial removal of Fe and Mn from NiFeMn parent alloys [49,50]. Such a robust mesoporous catalyst is attractive for alkaline electrolyzers where water-based solutions are decomposed into hydrogen and oxygen as the only products. Another promising application where nanoporous metallic system could have a significant impact corresponds to Li and Na-ion ion batteries, where electrical energy is stored in the form of chemical energy. Also Detsi et al. have recently developed a nanoporous tin(NP-Sn) powder with a unique granular-like ligament morphology using Sn-Mg binary alloys as precursor and selectively removing the sacrificial Mg by free-corrosion dealloying. The typical microstructure of that NP-Sn powder is shown in Fig. 7a. [51,52]. The high magnification SEM of typical powder particles indicate that they are porous (see Fig. 7b). While the porous architecture is disordered like in common nanoporous metals, the ligaments exhibit granular-like morphology (see Fig. 7c), rather than an interpenetrating ‘nanowire’ type morphology. The new NP-Sn powder exhibits stable cycling as anodes in combination with both lithium andsodium.Fig. 7d shows an example of galvanostatic charging and discharging curves obtained during lithium storage(release) in(from) NP-Sn; good stability over a few hundred cycles can be achieved [49,50]. We conclude that in particular, the exploitation of nanoporous metals in energy-related applications such as hydrogen fuel production and batteries opens novel avenues for fundamental and applied research in the field of functional nanostructures. Fig. 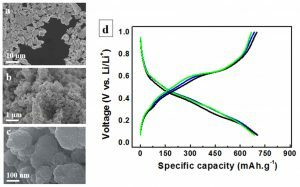 7 Nanoporous Tin (NP-Sn) as anode material for the next generation Li-ion battery (a) As-synthesized fine NP-Sn powder dispersed on a carbon substrate. The powder particles have random shapes and random size in the sub-10 µm ranges. (b) High magnification SEM showing that the powder particles are porous. (c) The ligaments exhibit granular-like morphology. TEM analysis reveals that these granular ligaments are in turn porous (not shown). (d) Examples of galvanostatic curves obtained using Li+. Good stability over a few hundred cycles can be achieved [51,52]. The authors are thankful to the Netherlands Organization for Scientific Research (NWO-the Hague, Mozaıek Grant 2008 BOO Dossiernr: 017.005.026 and the Rubicon Grant Dossiernr: 680-50-1214 and the Zernike Institute for Advanced Materials, University of Groningen, the Netherlands. 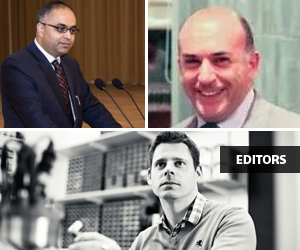 Contributions of TEM preparations by Dr. Jian Cun Rao (now at Harbin Institute of Technology, China) and Dr. Mikhail Dutka (now with FEI, the Netherlands) and discussions with Patrick Onck (Groningen) are gratefully acknowledged. Kudoh K, Gotoh T, Satoj K, Yamagata Y, Furutani K and Higuchi T. 1990. Development of Piezo Micromanipulator for cell Micromanipulation. Journal of Mammalian Ova Research 7(1): 7-12. Salomons E, Griessen R, De Groot DG, Magerl A. 1988. Surface-tension and subsurface sites of metallic nanocrystals determined by H-absorption. Europhysics Letters 5(5):449-454. Nahar MS, Zhang J. 2011. Int Conf Sign ImProcAppl IPCSIT 21 (IACSIT Press Singapore). Detsi E, Petrissans X, Cook JB, Liang Y-L, Dunn B, Tolbert SH (2015) Unpublished results.